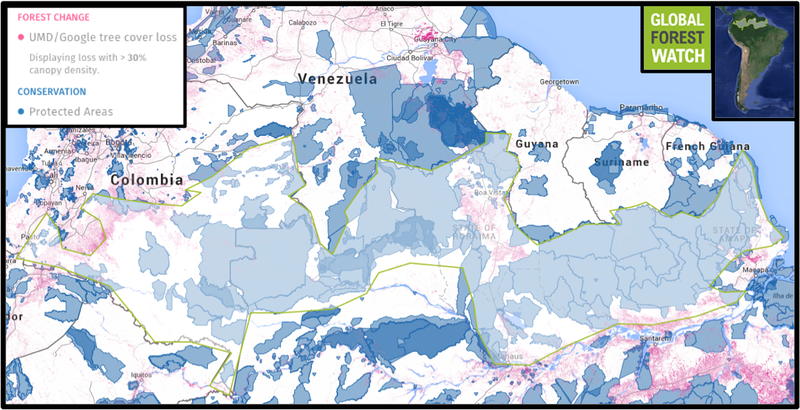 Colombia is planning a 135 hectare corridor that stretches through Venezuela and reaches Brazil. Colombian president Juan Manuel Santos has pushed for a joint-venture with Venezuela and Brazil to protect one of the richest and most biologically diverse regions in the world. The protected area would connect the Andes Mountains, South America's largest mountain range, with the Atlantic Ocean through the Amazon rainforest. Thus creating what Santos is calling the Triple A corridor. The reservoir would be located predominantly in Colombia an Brazil, with Venezuela just providing 4% of the total area. The Colombian plan is to get the governments of the other two nations on board by the November when the next UN conference on climate change (COP21) is held in Paris. The creation of this passage could be a vital step in the fight agains climate change, and would protect the Amazon Rainforest, sometimes called the lung of the planet, from ravaging human deforestation and tremendous loss of biodiversity. The impact of climate change and deforestation has already manifested itself in Brazil over a catastrophic drought that has recently struck the country. The drought is one of historic proportions and unprecedented in the history of Brazil. Colombia and Brazil are two of the five most biodiverse countries in the world. One in ten known species in the world live in the Amazon Rainforest. This is why the preservation of this corridor would represent an unparalleled effort in protecting and preserving wildlife.